Once their root system is established, mangroves provide the perfect habitat for shrimps, lobsters and oysters. They also slow the water flow around the root area, improving coastal water quality, providing the necessary habitat for wildlife and playing a role in protecting coastlines from erosion, tsunami and storm surges. 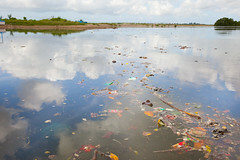 In Bali the mangroves are experiencing stress due to rising sea levels and a changing climate, or are being replaced by shrimp farms and repercussions of human development such as pollution and silt run-off. All of this can significantly alter these coastal ecosystems, threatening vital clean water sources, protective natural habitats, tourist industries and the food supplies on which we rely.